Arris SBG6400 review, one of the top cable modems and Wi-Fi router combo devices on the market. Made by Motorola under the flagship name Arris Surfboard, the device sets the trend with 8 times faster download speed and also up to three times the wireless speed of regular networking setups. Having been a victim of sluggish speeds before, I do know the importance of getting the right router. The SBG6400 comes with speeds of up to 300 Mbps and it is one of the best-priced products currently. If you're looking to transform your internet experience, then look no further than the Arris SBG6400. By reading our Arris SBG6400 review you will know if this modem fits your needs or not. Whether you're looking to upgrade your existing home set up or installing a new home network, the core of the entire setup is the wireless router. And as much as having the quality network cables will increase your speeds, a wrong router can severely hamper performance leaving you feeling frustrated. To fully enjoy your streaming and gaming, you will need to fully utilize all the bandwidth at your disposal. So, what is it that you should consider when purchasing a new router? The Surfboard SBG6400 is one of the top cable modems in the market. The interface is clean making the device easy to operate and maintain. Designed with the durable quality characteristic of Arris products, the modem is ideal for everyone from your average consumer to the high-end customers. Router range differs from router to router and paying attention to this specification can help avoid having blind spots in your home. The price of a good router ranges from as low as $20 to the upwards of $300. Although your choice will likely be dictated by your budget, you should ensure that it meets your needs in the first place. The device is very reliable and easy to operate enabling you to upgrade your home network without any hassle. The device comes with a reliable 2-year warranty and supports speeds of up to 300 Mbps thanks to its use of DOCSIS 3.0 technology which is up to 8 times faster than the traditional DOCSIS 2.0, find more about DOCSIS differences by clicking the highlighted part. Similar to the Arris Surfboard SBG6400, the SBG6782 is powered by DOCSIS 3.0 technology. Delivering Wi-Fi speeds of up to 1800 Mbps and download speeds up to 343 Mbps, the router is suitable for gaming and streaming. Although a little bit expensive, it's faster and can be able to support massive tasks. Backed by a 2-year limited warranty the device is worth the extra dollars. The TP-Link N300 is an ideal choice for anybody who wants a reliable performance and great signal strength. Price in the same region as the Surfboard SBG6400, it is compatible with Xfinity and spectrum. At 300Mbps, the wireless speed might be a less than satisfactory if you have high consuming resources. On the bright side, it features guest access and parental control features. The AC1900 is a top tire modem router combo with great service specific functionalities and unrivaled speeds (Up to 1.9 Gbps). The price tag can be discouraging but if you need to perform high resource consuming tasks, then this is the device for you. It is the only combo unit that uses 24×8 channel bonding with downloads standing at an amazing 960 Mbps. On top of that, the Nighthawk AC1900 the ReadyShare feature allows to share connected resources such as printers and TVs as well as media files with other users on the network. It is easy to set up and the NetGear Genie App makes it for the user to monitor and control the network. A single band router can only pick up the 2.4 GHz band, while the dual-band router can pick up both the 2.4 GHz and 5 GHz bands. Due to this, a single band router can easily be slowed down by interferences from nearby electronic devices. If you happen to be in a busy area, opting for a dual band will do you the world of good. A USB port can be used to connect anything from a flash disk to portable hard drives. Anyone in your network can then be able to access the shared items. On top of that, you can be able to connect printers, audio devices allowing you to use them remotely. Most of the routers in the market (802.11n) support around 300 Mbps. The 802.11ac protocol can support speeds to the upwards of 600 Mbps but before settling for the standard, look to ascertain whether all your devices are supported. The Arris SBG6400 Gigabit Router comes packed with a small documentation flier, an installation booklet, a wall power adapter, a small ethernet cable, a warranty which is only available if you save the receipt and of course, the modem itself. The Arris SBG6400 has the following number of downstream channels 8 and upstream channels 4, it features IPv4 support and IPv6 support. It has 2 integrated switch ports, 2 antennas, and a 343 Mbps maximum transfer rate, the universal RJ-45 connector type and runs well with all know operating systems. We hope you liked our Arris SBG6400 review as Arris surfboard is one of the top brands in the industry setting the trend in terms of quality and items sold we are sure that you understand why we reviewed this product. The SBG400 has the capability to transform your home network helping you reduce the unnecessary clutter. Once your network is transformed, you will be surprised how the performance of your devices can be improved. And since electronic gadgets will always keep on advancing, you will need a modem that is future proof. 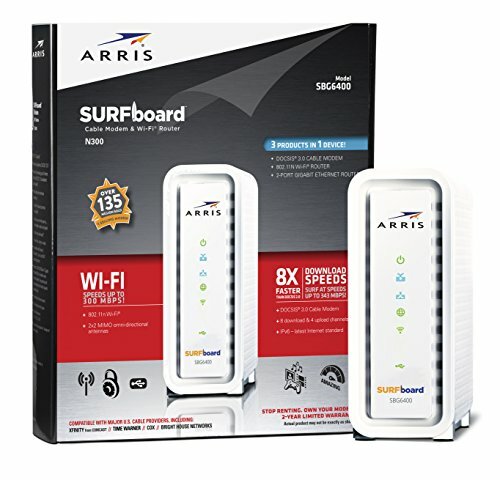 That being said, if you are looking for a modem that ticks all the boxes, then the Arris Surfboard SBG400 is the device for you.